Where Did the National Party Lose Their Majority? The drama may not be over, but we can eliminate one outcome even before negotiations begin: it is now clear that the National Party failed to get enough seats to govern alone or with support partners as suppliant as ACT, United Future and the Maori Party (the last two of whom were eliminated last night). 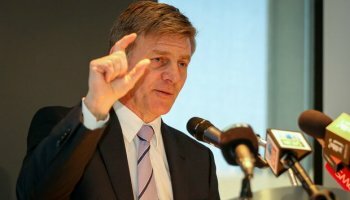 If they are to govern, it must be with New Zealand First, which is a significant weakening of their position compared to the previous election. This article looks at where National lost support from 2014. First of all, it’s apparent that the people who voted National last night were basically the same sort of person who always votes National. The correlation between voting National in 2017 and voting National in 2014 was 0.989. So the differences between the people who voted for them last night and who voted for them in 2014 are subtle. The National Party did worse with white people this time around, although white people were still the overwhelming bulk of National voters. The correlation between being of European descent and voting National in 2017 was 0.51, down from 0.60 in 2014, balanced by an increase in the correlation between being Asian and voting National in 2017 (up to 0.17 from 0.09 in 2014) and between being a Pacific Islander and voting National in 2017 (up to -0.38 from -0.46 in 2014). This is suggestive of a fairly large segment of both Asian and Pacific Islander people who have managed to rise above their previous economic situation. It also reflects the increase in correlation between working in wholesale trade and voting National in 2014 (0.19) compared to voting National in 2017 (0.26), because wholesale trade is itself an industry with a large proportion of Asian workers. Because Asians and Pacific Islanders are more likely to be born overseas than Maoris and white people, this has led to a strengthening of the correlation between being born overseas and voting National, which was already moderately significant at 0.33 in 2014 but has since then increased to 0.39 in 2017. South Islanders still support the National Party more than North Islanders, but the correlation between living on the South Island and voting National went down from 0.13 in 2014 to 0.07 in 2017. This is probably a reflection of the fact that National increased their support among recent immigrants at the expense of Kiwi-born voters, because a relatively higher proportion of recent immigrants live on the North Island. The correlation between working in a particular industry and voting National in 2017 increased from 2014 in the case of manufacturing (up to -0.19 from -0.23), wholesale trade (up to 0.26 from 0.19) and transport, postal and warehousing (up to -0.47 from -0.51), and decreased from 2014 in the case of mining (down to -0.05 from 0.00), hospitality (down to -0.23 from -0.18), professional, scientific and technical services (down to 0.15 from 0.18), public administration and safety (down to -0.30 from -0.26), education and training (down to -0.31 from -0.27), healthcare and social assistance (down to -0.23 from -0.18) and recreation and arts services (down to -0.22 from -0.17). This is perhaps interesting because it suggests that people are more likely to go from voting National to voting Labour if they have a social job, compared to being even more likely to vote National if they have a relatively unsocial job. Related to this is that social occupations tended to leak support for National compared to unsocial ones. Although managers continued to strongly support National in 2017, as the correlation between working as a manager and voting National in 2017 was 0.52, this was weaker than with voting National in 2014, which was 0.56. A similar drop was seen in community and personal services workers, whose correlation with voting National in 2017 dropped to -0.58 from -0.53 in 2014. Taken together, these correlations show that people whose jobs bring them into contact with the most people are the most likely to feel that the country needs a change in direction, perhaps suggesting that they have observed an increase in human misery to intolerable levels. Some won’t be surprised to note that the correlation between living in a mortgaged house and voting National in 2017 increased to 0.05 from 0.01 in 2014 – perhaps an indication that people in this group are afraid of the market crashing and leaving them with negative equity. Tellingly, this group became much less willing to vote New Zealand First – the correlation between living in a mortgaged house and voting New Zealand First in 2017 dropped to 0.06 from 0.12 in 2014. Taken together, those numbers suggest that a lot of people want the game of hot potato being played with house prices and immigrants to continue for a while yet. Where the election seemed to be lost for National, at least in terms of their hopes of governing alone or with ACT only, is when the real elite class, despite still mostly supporting National, did so less overwhelmingly than in 2014. The correlations between being in any of the four highest income brackets and voting National all weakened from 2014 to 2017. These were those earning $60-70K (down to 0.21 from 0.24), those earning $70-100K (down to 0.32 from 0.36), those earning $100-150K (down to 0.31 from 0.34) and those earning $150K+ (down to 0.31 from 0.35). They also weakened noticeably among holders of postgraduate degrees. Voters with an Honours degree had a correlation of 0.22 with voting National in 2014 but only one of 0.17 with voting National in 2017. Holders of Master’s degrees (down from 0.20 in 2014 to 0.17 in 2017) and doctorates (down from 0.20 to 2014 to 0.14 in 2017) followed the same pattern. The cohort of National voters is also younger this year compared to 2014. The correlation between median age and voting National decreased to 0.77 in 2017 from 0.81 in 2014. What all this tells us is that there were three major trends in play last night. The first one is that Labour won votes off the Greens, New Zealand First and National. Labour won a huge number of Maori voters from New Zealand First and the Greens – the correlation between being Maori and voting Labour in 2014 was only 0.42, but in 2017 it was 0.58. The second is that National won a lot of votes from people who were educated and young and Green-voting in 2014, but who grew up to be wealthy, middle-class and incentivised to vote with their wealth interests in 2017. The Greens dominated this segment of the population in 2014 and lost most of them by 2017, chiefly to TOP and to National. The third is that National lost a lot of votes from the sort of person who is the real power elite of the country. Although the rich, the employers, the owners of freehold land, Anglicans and educated people all still preferred National to Labour, they were markedly less keen in 2017 than 2014. Many of these people switched to TOP, which is ironic because they now won’t be represented at all (at least not directly). This article is an excerpt from the 2nd Edition of Understanding New Zealand, which Dan McGlashan and VJM Publishing will have ready for sale at the end of October 2017. This will contain statistics calculated according to the official final vote counts and will be freshly updated with data from the 2017 General Election. Next Next post: Who Voted for The Opportunities Party?